Kota Kinabalu (Tuesday) - The SME development has been an encouraging force of late. Many entrepreneurship initiatives carried out by various ministries and agencies have helped entrepreneurs throughout Malaysia. According to SMECorp statistic, as at end of 2016, 98.5% business establishments in Malaysia are SMEs which contributed 36.6% of the nation's GDP and 65.3% of the country's employment is created by the SMEs businesses. SEDIA, among others, facilitated the SME development in the state, organising SME programmes consistent with one of SDC's three key principles, that is, capturing economic value activities. Started during the Second Phase of SDC (2011-2015), the SME programmes were aimed to build a critical mass of SMEs to serve downstream manufacturing company created, to expedite the growth in the new industries in Sabah and to encourage the society to be more involved in business and entrepreneurship. The initiatives became more vibrant as SDC enters into its Third Phase in 2016. This augurs well in accelerating the economic growth having a strong base of local SMEs. SEDIA was invited to provide a talk during one of the seminar organised by Sabah Ministry of Trade and Industry. 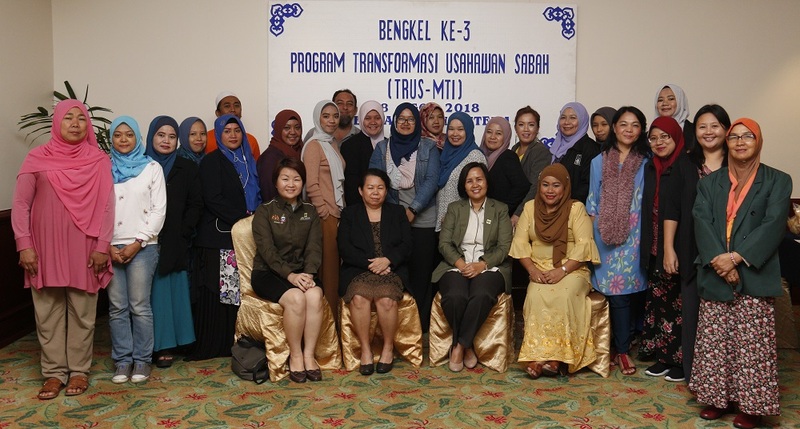 The event was one of the eighth edition of Sabah Entrepreneur Transformation Program (Program Transformasi Usahawan Sabah) this year. During the one-day seminar, 25 local entrepreneurs were given latest information on entrepreneurship from various related agencies. The seminar participants were also briefed and updated of SEDIA's role in facilitating the SMEs, particularly in the state. One of the initiatives in facilitating the SMEs was collaborating with Unit Peneraju Agenda Bumiputra (TERAJU) to help boost development of local entrepreneurs. Having a TERAJU@SDC secretariat located at SEDIA's office, has helped to enhance participations of local entrepreneurs in SDC's projects as well as to assist entrepreneurs gaining access to facilitation fund under TERAJU. Aside from working together with other agencies, SEDIA also organised a variety of entrepreneurial activities, among others are the 1AgroSAIP (downstream agro training), HotDesk (basic entrepreneurship training) and SDC 1Bizlink (business advisory services). Most of these programmes take place at Sabah Agro-Industrial Precinct (SAIP) which is also one of the SDC's flagship projects for entrepreneurship and SME development. To further assist the SME development, SEDIA has crafted a programme that can nurture and grow SME development in more holistic approach. This way, SEDIA is able to provide support for entrepreneurs, start-ups and companies to realise the potentials and to scale up their ventures. Two crucial components in the programme are the SDC SME Incubator and SDC Business Accelerator. Since SEDIA initiated the programme in 2016, a total 1,587 participants registered collectively. As at July 31, 2018, there are 255 people registered in the SDC Incubation programme, of which 132 incubation participants had received approval for funding with an accumulated grant of about RM11.86 million, of which total project cost is RM54.28 million. For the Accelerator programme, four projects with RM819,792.90 in funds have been approved, with a total project cost of RM3.87 million. Amongst SEDIA's role in supporting the SME is to encourage investment into the rural areas and create more income generation opportunities for the rural communities.